Blog | Bill's Auto Electric & Repair, Inc.
It’s said that 90 percent of our driving decisions are based on visual information. Our wiper blades play an important role in this. Most Santa Rosa drivers know that a dirty or streaked windshield can catch the glare of the sun or on-coming headlights and make it nearly impossible to see. Most busy Santa Rosa car owners deal with their wiper blades from a failure perspective. They address them when they no longer function. Instead, Santa Rosa drivers should think about wipers blades as an important safety system that they should maintain, rather than repair. At Bill's Auto Electric & Repair, Inc., we recommend that Santa Rosa motorists change their wiper blades twice a year, in the spring and fall. That way you have functional blades for those spring showers and California winter storms. And consider a windshield treatment to help repeal water and make it easier to clean off bugs and road grime. Like everything else in the automotive world, there’ve been some big advancements in wiper blades, both in terms of the design and the materials from which the blade is made. We can help you get the same type of blades that came with your Avon vehicle, or if you have a need for better than average windshield wipers, you can pay some more for an upgraded wiper. And if you live where there’s a lot of snow and ice in California, they make special winter blades that don’t clog up and freeze like standard blades. Give us a call for more information about wiper blades or any other automotive part or service. 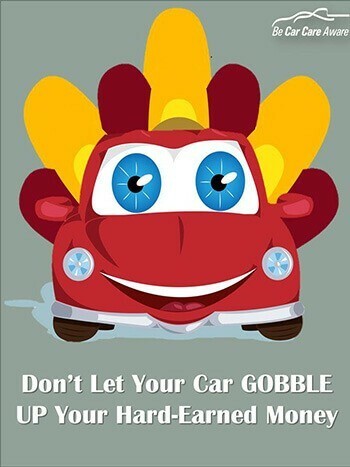 Happy Thanksgiving from our family at Bill's Auto Electric & Repair to yours! We hope you have a safe and happy holiday! In a large bowl, beat eggs until foamy, and stir in melted butter. Stir in the brown sugar, white sugar and the flour; mix well. Last add the milk, vanilla and nuts. 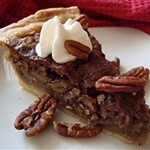 Pour into an unbaked 9-in pie shell. Bake in preheated oven for 10 minutes at 400 degrees, then reduce temperature to 350 degrees and bake for 30 to 40 minutes, or until done. While you’re busy preparing for another holiday season, don’t let car care take a back seat. Neglected auto care almost always means much higher costs down the road in the form of more extensive repairs or lost resale value. The non-profit Car Care Council recommends that you be car care aware to ensure your car doesn’t gobble up your hard-earned money. The Car Care Council suggests a quick vehicle check to help avoid the unplanned expense of a breakdown when traveling by car this holiday season. • Check the tires, including tire pressure and tread. Uneven wear indicates a need for wheel alignment. Tires should also be checked for bulges and bald spots. • Check all fluids, including engine oil, power steering and brake and transmission, as well as windshield washer solvent and antifreeze/coolant. • Check the hoses and belts that can become cracked, brittle, frayed, loose or show signs of excessive wear. These are critical to the proper functioning of the electrical system, air conditioning, power steering and the cooling system. • Check lighting to identify any problems with exterior and interior lighting, as the chance of an accident increases if you can’t see or be seen. • Check wipers. Wiper blades should be replaced every six months. Make sure the windshield wipers are working properly and keep the reservoir filled with solvent. The Car Care Council also recommends that motorists restock their emergency kit. To save on fuel costs during the trip, the council suggests that motorists avoid aggressive driving, observe the speed limit and avoid excessive idling. Gas caps that are damaged, loose or missing should be replaced to prevent gas from spilling or evaporating. The Car Care Council’s free personalized schedule and email reminder service is a simple way to help you take better care of your vehicle this holiday season and throughout the year. It is an easy-to-use resource designed to help you drive smart, save money and make informed decisions. 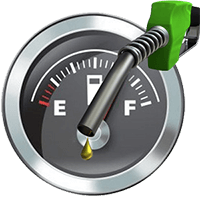 Let’s review some things that Santa Rosa motorists can do to improve gas mileage. Bottom line – the better you maintain your truck, the less fuel you will use. It all adds up in a big way. For example, replacing your dirty engine air filter will pay for itself in fuel savings before your next oil change and will keep saving you money after that. A clean, well-maintained fuel system really pays big dividends for budget conscious Santa Rosa drivers. A clogged fuel filter wastes gas. So does a dirty fuel system, grimy fuel injectors and plugged up PCV valves. A fuel system service decreases the gas you use, and increases the power – so you can’t go wrong with that. Some of us Santa Rosa motorists ignore our check engine light. But fixing the problem that caused the light to come on will usually save some fuel as well. It may be a bad oxygen sensor that can really rob your fuel efficiency. And, it may be time for a tune-up. Tune-ups should improve your gas mileage. Don’t overlook the routine maintenance items, like scheduled oil changes, transmission and cooling system service. Dirty or low fluids actually use more fuel. Just look at your automobile manufacturer’s recommended service intervals in the owner’s manual, or ask your caring Santa Rosa Automotive service specialist for the schedule. Don’t forget your tires. Underinflated tires waste gas. And if your wheels are out of alignment you won’t get the fuel efficiency you need. None of these things are very complicated or expensive for Santa Rosa drivers to stay on top of. When you maintain your car properly, you save gas today and prevent expensive repairs tomorrow. Maintaining your vehicle’s tires is not only essential to getting better gas mileage, but it is also crucial to ensuring safe on the road. To maximize tire life, the Car Care Council recommends checking tire condition and pressure regularly, and there is no better time to start than National Tire Safety Week. Pressure – Correct tire pressure is good to your wallet and the environment as properly inflated tires can improve gas mileage by three percent or ten cents per gallon. Underinflated tires are under stress and wear uneven, causing them to be replaced sooner. Alignment – If your car is shaking or pulling to one side it could be a sign of an alignment issue. Because uneven or accelerated tire wear may indicate an alignment problem, it’s a good idea to have your car’s alignment checked at least once a year.